Ariana inherited her love of cooking and food from her father — who owned a French fine-dining restaurant in pre-Revolutionary Iran and later a trendy bistro in Beverly Hills — and from her grandparents, who grew all kinds of fruits and vegetables and raised animals on their land in Iran. She grew up in New York and London and has also lived in France, Italy, Switzerland, Singapore, California and Dubai. After collecting a business degree in London she trained as a pastry chef at Le Cordon Bleu in Paris where she worked at Le Nôtre and Fauchon Patisserie. She then became Head Pastry Chef for the Mondrian Hotel in Los Angeles where she prepared special desserts for famous personalities such as Bill Clinton and Oliver Stone and catered for show business parties such as The Oscars and Vanity Fair. Her first cookbook ‘Sweet Alternative’ (Conran-Octopus UK), was the first gluten, dairy and soy free dessert cookbook. It blended her pastry expertise with a personal desire to provide appetizing desserts for those suffering from food intolerances. 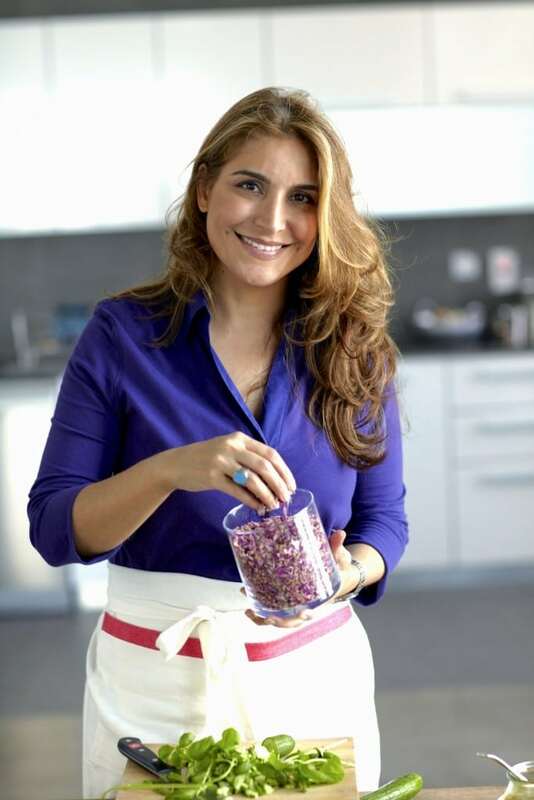 She then turned her focus to re-discovering her childhood cuisine and, after re-training at Le Cordon Bleu in cuisine, wrote ‘Pomegranates & Roses: my Persian family recipes’ (Simon & Schuster UK). The book contains charming anecdotes and stories about her Persian family and growing up in Iran. and is stunningly illustrated by Lisa Linder, who also did the photography for Sweet Alternative. The book won an award at the Gourmand Cookbook Awards in 2012 and was shortlisted for the Best Cookery Book at the UK Guild of Food Writers Awards. Ariana then decided to bring Persian cuisine to a wider audience by making a TV show. The resulting 8-part “Ariana’s Persian Kitchen” was a true labor of love for Ariana, who wrote and directed the series as well as co-producing and presenting it. It was also a family affair with husband Paul co-writing and producing and guest appearances by her mother, brother and young son Dara. The show premiered on NatGeo People and has gone on to air in dozens of countries on other channels including Fox Life India and TV Paprika. It has won several awards including the Gourmand Awards Global Best TV Producer. Ariana has appeared on TV shows such as the Channel 4’s Sunday Brunch, BBC’s Good Food Live, Sky’s Taste, Euronews, FOX and Top Billing. Ariana currently lives between California and Dubai.